Gene Medic was designed and programmed by Jason H. Moore, Ph.D. in 6502 assembly language for the Atari 2600. Dr. Moore is a Professor and Director of the Institute for Biomedical Informatics at the Perelman School of Medicine of the University of Pennsylvania with a research program focused on artificial intelligence and machine learning with application to understanding, preventing, and treating common human diseases. Motivation for this game from a lifelong interest in Atari video game systems and computers as well as a research interest in genomic medicine. 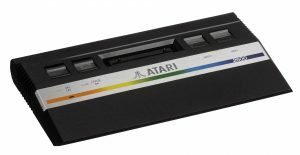 Additional motivation came from the significant challenge of coding for the Atari 2600 that has no graphics chip, 128 bytes of RAM, and a code capacity of 4k or less on the ROM in the cartridge. He is also actively involved in Atari 8-bit computers such as the Atari 400 and 800. He maintains the Atari Projects web page to help hobbiests find and complete fun projects for the Atari 8-bit computers and video game consoles. He is scitari on the Atari Age forums. Here are some links to more information about Dr. Moore’s research interests.